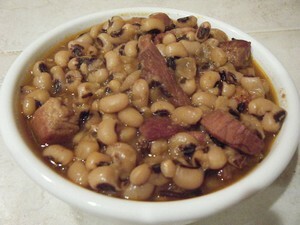 Rinse black-eyed peas & set aside. Saute the pork belly & ham in batches until browned . to the pot with the meat and saute for a few minutes. Add broth, black-eyed peas & bay leaves; stir. Open pot, stir & remove the bay leaves. *Pork belly & ham amounts are guesstimates, I didn't weigh mine. Add as much pork/ham as you want. You can also use just pork, ham or bacon, or omit the meat. I used chicken broth but you could also use ham broth or vegetable broth.